Jamie Oliver brings his version of rustic Italian cuisine to the heart of London courtesy of Jamies Italian. Similar experienc. Wery poor customer service! Very rude duty manager. Not what you expect when you are paying Also, we had a 'hard sell' for a 'home made' chocolat cake, wher we tried to order it, it wasn't available! I must have had the same duty manager. Rude, contradictive and argumentative when they couldn't proivide the table we had reserved! they need a lesson in good manners! I have had a similar experience there! Dreadful manager, p[oor service! As we were a party of six we booked in advance. We reserved a table for 5pm, we had theatre tickets for 7pm. On arriving at about 4.50, we were told that the table would be free shortly as the previous diners had finished and were about to leave. We waited and waited and waited, the diners showed no signs of leaving, but were killing time waiting in the restaurant. 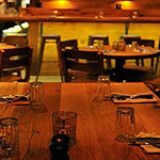 The manager was particularly unhelpful and unfriendly to the point of being hostile, saying “our policy is to leave people at their table for as long as they like”, with no concern for others who might have made a reservation. The restaurant was chaotic; no one seemed to know what was happening and on one was taking any charge or responsibility.. At 5.40 we were shown to another group of tables pulled together to accommodate us as our table was still occupied, although the party had finished their meal nearly an hour earlier and were killing time watching children colouring, possibly waiting for the rain to clear! At 6pm we managed to get some bread and order our meal (I hour and 10 minutes after arriving WITH a reservation). We then had to rush the meal. Despite the wait, service was slow and patchy when we did get a table. We were not offered a wine list and had another wait after requesting it. Our first waiter disappeared and was replaced by another waitress. The food was at best adequate, but nothing special. Bland overpriced pasta. But having waited over an hour and having had to deal with the appalling chaotic service and dreadful manager, I doubt anything would have tasted good. Just avoid this place until they learn the basics of customer care and service. You would get similar food and superior service in any school canteen! Great atmosphere, very efficient genuinely friendly staff. However I actually walked out of this place on Saturday night. I was served a sirloin steak that tasted like burnt metal, was chopped up and was completely inedible. The waitress handled everything perfectly and I was more than happy to share my wife's pasta. A duty manager then insisted on contradicting me, patronising me and generally trying to pick a fight. She was asked to leave us alone four times until I left instead. I did raise this issue with Jamie's Italian on-line feedback service but have heard nothing back, which is a pity because a lot of the staff do a really, really great job, however this is more than negated by their management. nice food but not blown away, great atmosphere, reasonable prices on a majority of dishes but not all. the pager facility is a detriment to other customers walking in and having to wait for 30 mins when the eye can see tables free!! i will go again to try their pasta dishes and i can then judge whether i will return back to jamies kitchen or not. service need to be improved. Great food, great atmosphere, great prices, really pleasant staff. Although you cannot book for parties of less than 6 people, the paging facility allows you to stay locally and wait for your table. Superb idea. The fantastic chocolate and raspberry dessert is to die for! We had a wonderful night, thankyou. Will definitely see you again. The twelfth in an ever-growing chain, Jamie’s Italian in Covent Garden sticks to the same formula of rustic Italian food and decor. Like the other Jamie’s Italian restaurants, the Covent Garden location is laid back and relaxed, a mix of rustic-looking woods and modern furniture. There are several different enclaves in the space with a main seating area that features red metal chairs. 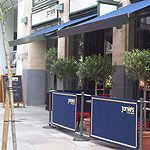 A bar and a meat counter are located near the entrance along with a small alfresco area and patio doors that open up on to Upper St Martins Lane. There doesn’t, however, seem to be the same creative touches that are prevalent in other London branches, like the graffiti in Kingston or the tree-stump tables in Canary Wharf. 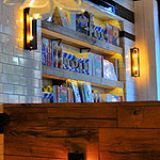 For foodies – and Jamie Oliver fans – there are shelves stacked with pasta, cookbooks and various merchandise. By about 1pm, it’s packed, although there’s no sign of the legendary out-the-door queues. Staff are sweet but service is a little slow, especially when it’s busy. Expect the crowd to consist of everything from big groups of tourists (hoping to catch a glimpse of the man himself, no doubt) to people who work nearby. Unfortunately, there’s a lot of construction going on nearby at the moment – sometimes it seems like it’s right next door – and although the staff apologise and seem to be doing everything they can to keep the noise at bay, it’s still pretty jarring. One the place fills up, though, there’s a good buzz that’s almost loud enough to drown out the drilling. The casual Italian food matches the decor and the menu, with its adjective-heavy wording (dishes are amazing, or humble, or proper, or beautiful), is big on rustic dishes. A starter of crispy squid (£5.10) has a good, crisp batter but the squid itself is quite tough and the ‘really garlicky mayo’ is only really garlicky thanks to a big clove of the stuff plopped in the middle of it. Other starters include veggie and meat antipasti boards, veggies and mozzarella dishes, plus bar-style nibbles like olives and nachos. There are a few types of mains, including pastas (which are also served in a starter size), grills (cooked under a hot brick) and salads. The wiggly pappardelle with mini meatballs (£6.65/£10.25) is, thankfully, not wiggling, but merely crimped at the edges so that the dish resembles a bowlful of frilly ribbons. The pasta is cooked well, slightly al dente, and although the pork and beef meatballs are surprisingly larger than their ‘mini’ description suggests, they’re slightly dry. The sauce has a hint of cinnamon, which works well with the meat. A side salad of mozzarella and tomatoes (£4.35) is fresh and simple. Puddings feature a variety of cakes and tarts, plus ice cream and sorbets. The ‘awesome’ chocolate and espresso tart (£4.95) comes pretty close to its moniker, with a rich, flavourful and smooth chocolate and crisp pastry base. Although the figs on top don’t really add anything to the plate they don’t really take away anything either, which is more than can be said for the bitter-tasting orange creme fraiche on the side. Tap water is offered when you sit down, which is always appreciated, and other soft drinks include sodas, aranciata and limonata sparkling drinks, elderflower and ginger and lemongrass presses and juices, plus hot drinks. Alcohol-wise, there are a couple of aperitifs including an interesting sounding grape and cucumber martini (£5.95). 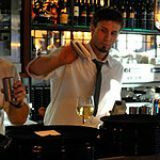 The Italian wine list offers about 16 choices (including two organic wines) available by the glass, 500ml carafe and bottle, plus a few proseccos and sparkling wines. Solid but unspectacular, Jamie’s Italian in Covent Garden is proof that the chain is showing no signs of slowing down.